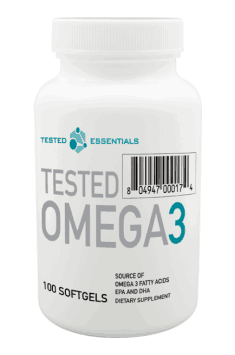 TESTED Omega-3 is a dietary supplement containing in its composition fatty acids EPA and DHA. The product is recommended in the prophylaxis of cardiovascular and neurodegenerative diseases and also to pregnant women and people with lower immunity of the organism. Eicosapentaenoic acid (EPA) – is an organic chemical compound from the group of omega-3 fatty acids, belonging to polyunsaturated fatty acids. It is also called Essential Fatty Acid (EFA), as it is essential for the proper functioning of the organism. In small amounts it is synthesized from ALA, however, it needs to be provided from outside. It takes part in transmitting signals between nerve fibers, supporting memory, concentration, mental ability and learning processes. It regulates lipid balance, lowering the level of LDL cholesterol and triglycerides. Docosahexaenoic acid (DHA) – is and organic chemical compound belonging to EFAs, which abundantly appears in oily fish. It appears in the brain area in 97%. It regulates the work of the central nervous system, supports learning processes and strengthens memory. It exhibits strong antioxidant and neuroprotective effect. It prevents hypertension, takes care about the health of the cardiovascular system and demonstrates positive influence on the level of cholesterol in blood and also takes care about vision. Its deficiency causes decreasing the neurotransmitter – serotonin in the brain, which contributes to developing depression and anxiety. Proper concentration of omega-3 in the organism conditions proper formation and work of the brain since the fetal life of the human. They improve blood supply to the brain and facilitate the flow of nervous stimuli. Eating products rich in EPA and DHA or taking supplements supports creativity, concentration and also decreases the risk of developing neurodegenerative diseases. DHA and EPA acids take care about the health of the cardiovascular system. They prevent excessive aggregation of thrombocytes, which counteracts the creation of clots and embolisms and have the ability to thin the blood. They inhibit the synthesis of thromboxane A2 responsible for stimulating coagulation. They reduce inflammations in arteries, which lead to their calcification. They regulate lipid balance, lowering the level of cholesterol LDL, vLDL and triglycerides, which is reflected in decreased risk of developing atherosclerosis or heart attack. Omega-3 exhibit strong anti-inflammatory effect, by decreasing the synthesis of pro-inflammatory cytokines, e.g. TFN alpha factor or interleukin IL-8. They decrease the production of enzymes taking part in the creation of eicosanoids COX-2, which activate pro-inflammatory markers in the organism and increase the secretion of strong anti-inflammatory substances, e.g. resolvin and prolactin. EPA and DHA increase sensitivity of cells to the effect of insulin, which is related to lowering the concentration of glucose in blood. Moreover, the presence of omega-3 acids stimulates the production of visfatin, inhibiting the secretion of glucose by the liver and increasing its uptake from the circulation. Proper concentration of omega-3 limits the risk of developing diabetes type 2 and insulin-resistance. Omega-3 demonstrates positive influence on the immune system. It increases its natural immunity and by the same token it helps to better deal with viruses, bacteria and microbes. Appropriate concentration of EPA and DHA prevents allergies and supports their potential treatment. It is recommended in the fall-winter season, when we are most prone to bacterial and viral infections. Omega-3 fatty acids are one of the most important structural elements of eye ball retina, therefore their proper amount may lead to macular degradation, which consequently leads to blindness. Summing up, TESTED Omega-3 is a dietary supplement containing the highest-quality acids EPA and DHA in the high dose. Additional substances take care about stability and increase the wide pro-health effect. The product is recommended to all people, who want to take care about their health in a complex way. One capsule 3 times a day during or after a meal. To minimize the risk of discomfort in the digestive tract and increase the preparation’s bioavailability, it is recommended to take it with a meals that is a source of fats. To maintain the best quality of the product, it should be stored in a cool and shady place. TESTED NUTRITION is a recognized manufacturer of sports supplements. In their offer you can find creatine hydrochloride and agmatine, which improves the supply of nutrients to the muscles, accelerates their growth and efficiency, and improves post-workout regeneration. The company also produces high-quality testosterone boosters and a well-balanced multivitamins and sets of minerals.